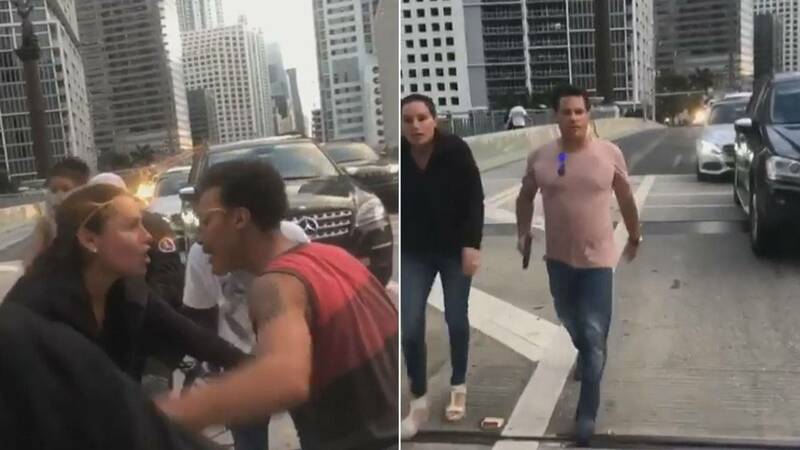 MIAMI - A woman involved in a clash with teenagers Monday in Brickell has been fired by the real estate company for which she worked, the company announced on social media. "Insignia International Properties does not tolerate discrimination. Dana Scalione is no longer affiliated with this organization," the company posted on its Facebook page Tuesday night. Scalione's termination comes after she was captured on cellphone video yelling at a group of teens who were blocking her car from passing the Brickell Avenue Bridge as they were protesting the redevelopment of the Liberty Square public housing complex. The video shows Scalione yelling that one of the teens ran over her foot with his bike and a screaming match ensues. "Don't touch me, you bunch of thugs," the woman tells the teens as she walks away from them, the video shows. Moments later, Scalione's boyfriend, identified by police as Mark Bartlett, 51, approaches the teens, holding a gun in his hand. He begins yelling obscenities and racial slurs at the teens, telling them to leave. "F---ing stupid n-----s," Bartlett can be heard saying in the video. Bartlett was arrested shortly after the incident on a felony charge of carrying a concealed firearm. Police said Bartlett didn't have a concealed carry permit for the gun, which was loaded and resting on the front passenger seat. Scalione is not facing charges and told Local 10 News reporter Madeleine Wright that racial slurs were thrown around from both sides. "I was called a white a-- first. Nobody calls them racist," Scalione said. "I was called a b----. Nobody says they hate women." Scalione said she doesn't believe the teens or her boyfriend are racist and said the incident was situational. Bartlett told Wright that he stands behind his actions and said he has no regrets other than not having a concealed carry permit. The incident led many to post on the Facebook page of Insignia International Properties, calling for Scalione's termination. The company posted that Scalione has been employed at the company since 2012 or 2013. "Quite a few people have been screaming at me as if I just hired Ms. Scalione and that's not the case," a post on the Facebook page read. "She started with Insignia in 2012-2013. I respect everyone is angry but just as multiple people have commented I was not there and those are not my opinions so if people would refrain from physical threats it would be appreciated. Because that makes all of us no better than the people that hate. We have to start respecting and loving one another. We are all human beings no matter of color, religion and beliefs." Many people praised the company in the comments section of its page for parting ways with Scalione. One woman thanked the company for their "swift action" and said she hoped Scalione would not find employment in the area. "Thank you and let's hope not," the company responded.